1. Do not stack uniforms. Hang on a hanger until completely dry. 2. Machine wash, (normal cycle) in water 68 to 100 degrees. No hotter than 100 degrees. It is best to rinse in the same temperature that is washed. 3. 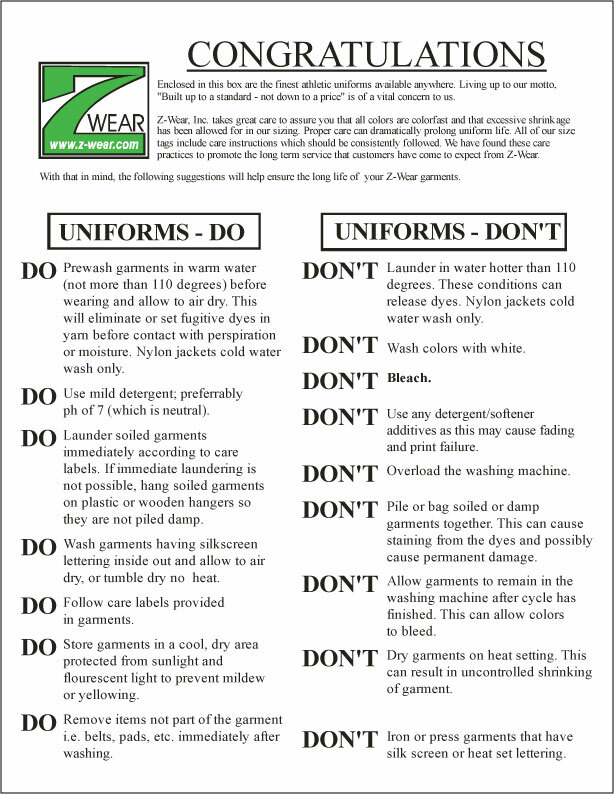 Do not soak a uniform for a long period of time. This may cause bleeding or fading. 4. Pre mix mild detergent in water prior to adding uniforms, always use a 10ph detergent or under. 5. When using bleach, this can cause color fading and may weaken the fabric. 6. It is best to put all uniforms on a hanger to store. 7. If drying with a machine dryer, Run at the lowest setting and remove when dry. Do not ever over dry. The temperature should not ever get above 100 degrees, this will cause melting. 8. Z-wear has no control over laundering and drying procedures therefore we can not guarantee color fast with fabrics and printing. 9. Garments will always shrink when dried and overtime fading and cracking will occur on every fabric made. Some fabrics take longer than others. 10. As a rule wash only one uniform the first time. If no problems occur, then wash the rest of the set. 11. Washing combinations and chemicals are different every where uniforms are washed. Some chemicals are more anti-bacterial than others. If a problem occurs contact Z-wear immediately. 12. If a bleeding problem starts. In most cases the uniform has been dried at to high a temperature or for too long. If the bleeding worsens the problem may be an acid mixture in the laundry soap. 14. When spandex is in uniform it is best drip dry. 17. Store in a cool dry area without sunlight. Sunlight will fade all colors. Fluorescent lights can cause mildew and yellowing in some cases. 18. If possible always wash uniforms after use for best cleaning results. 19. Z-wear understands that it is difficult to maintain the “brand new” look of gamewear. We want to help in any way possible.